White Cube Inside Out is a glitch exploration experience developed in Unity and a result of a one-week workshop with Dutch artist and theorist Rosa Menkman. In White Cube Inside Out, the visitors enter a virtual glitch gallery in which they can wander freely. It was first released on the Google Play platform in May 2012 and has also been available as a direct download for Android, Mac and Windows on the app's website (at http://whitecube.newmediaproject.de). In White Cube Inside Out, the players are encouraged to explore a virtual glitch gallery in which various exhibition pieces (glitched images and sculptures, earlier results of the same workshop with Rosa Menkman during which the interactive experience itself was created) are arranged on the walls, on the floor and in the air. But as they are drawn into the gallery's corridors, the environment itself starts to glitch, the visual output becomes impossible to predict. This is the moment when the curator (who is also the artist in this context) surrenders control over the experience, when the visitors of the gallery begin to find (and hereby, create) entirely new structures and compositions by walking and looking around. 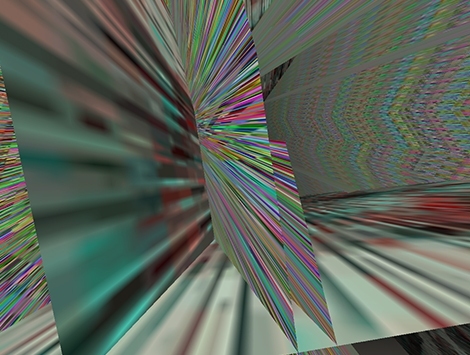 White Cube Inside Out explores potentials of software glitches as artistic and communicative tools helping to bridge the gap between artist and audience. So long as interactive pieces of art rely on designed interactions, efforts to achieve communication are prone to one-sidedness. Unlike a predefined set of interactions though, glitches offer unpredictability and uncontrollability and can be used to level relations.